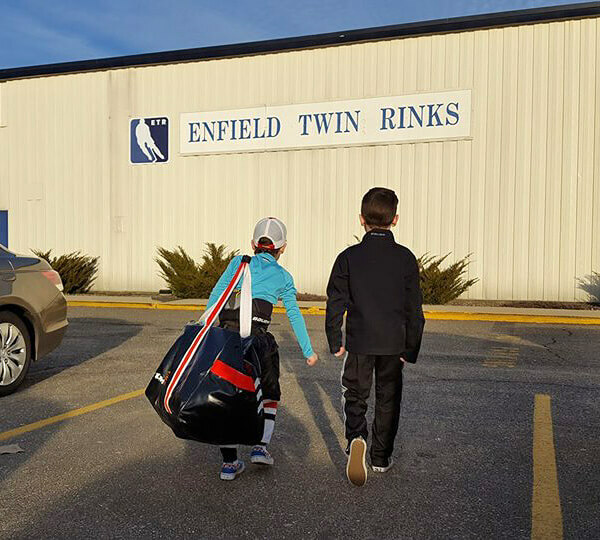 Late in the season, just before tryouts begin, the higher level teams in our area start welcoming players from other organizations to participate in their practices. Pretty certain that runs true across the country. While it's a recruiting tactic for the teams, obviously, it's also super beneficial to the players (and their parents) as you get the chance to "test drive" how another team or program runs their practices. And, from my perspective, the coaches and way practices are run are what really count. We've all blindly taken a leap of faith when we sign our kids up to play hockey -- paying a tuition without really knowing what we've signed up for. The "invites" to practices let you peek behind the curtain a bit before trying out or signing on. If you like what you see, yeah, you might think harder about potentially moving to another program. That's EXACTLY why teams offer it and EXACTLY why you should take advantage of it too. Sometimes the grass is greener on the other side. Sometimes. But, regardless of your intentions, it's free ice, different drills, different coaches, different players, and kind of exciting for the kids cause they're in a new environment. Well, exciting for my kids. I can understand how some kids would be uncomfortable, socially. Personally, I love it. Best ice is free ice. And it's a wonderful opportunity to see where your child is, skillwise, versus same aged players you're not super familiar with. Last year, we did it once. This year, we're doing it over and over and over. The part I don't like is the purported "walk of shame" to and from the locker rooms as if it should be kept a secret that you're "attending" rival program's practices. Last week, Henrik skated with another program on a night when his own team didn't have practice. We know their coach, Paul. We know their team manager, Scott, too. And both welcomed Henrik to skate with them just as they would with any other player. No special treatment. And it was great. Actually, Henrik lost a tooth on the ice and had a meltdown after swallowing it -- claiming his stomach hurt -- but, yes, it was still great. But while leaving the "rival" rink, we crossed paths with a handful of players and parents that play for the program we play with and the awkwardness that followed was off the charts. Without audibly saying it, the expression was, "Oh no! We've been caught at another team's practice!" Two parents truly looked like they've been caught with their hand in the cookie jar as I said "Hi!" just as I would at our own rink. First off, if your kids have been playing hockey for more than a season or two, the hockey world starts to get really small, really quickly. Everybody knows somebody who knows somebody else. No joke, my oldest is 8 years old and literally has 1 degree of separation from nearly every single hockey player from Maine to Delaware under the age of 10. If you think you can practice with another team within a 50-mile radius without it getting back to someone on the team you play for...well, you're delusional. Be open about it, be honest about it, and never, ever, feel ashamed for it. I don't think their's were either. I won't "out" them as I could tell they were uncomfortable about the whole situation and when we cross paths at our next practice, I'll pretend like I never even saw them at that "other" rink. For me and my kids, though, I know that we're still loyal to our team and that we'll always be very upfront about it. Yeah, Henrik skated with another team on an off night. I shared it on Facebook as it was happening. For real, the picture above is actual photo I posted as we entered the rival rink. And, yes, we'll probably attend their tryouts too -- provided that they don't over lap with his current team's tryouts or cost an exorbitant amount. So, yeah, let's end this walk of shame business. It doesn't have to be a big secret that your testing the waters elsewhere. That just shows you're a smart consumer. And, really, let's be honest...if you're already leaning towards leaving the program you're currently with, your team and program already know that. You might think it's a secret...but, really, it's not. No sense in trying to hide anything. And, again, no shame in looking to see if there's a better fit elsewhere either. Frankly, it's a disservice to your player if you're not looking for a perfect fit by routinely playing with the same program season after season cause every program has pluses and minuses and unless you look for it, you'll never know what you could be missing. Besides, we'll all be teammates at some point down the road. The hockey world really is that small.